Understanding primate diet plasticity and what causes foraging variation is crucial to understanding their ecology and evolution. Foraging choices are limited by food availability, and primate diets may shift within and between years. How primates respond to interannual variation and the extent of their dietary flexibility are poorly known. White-faced capuchins (Cebus capucinus imitator) have a diverse diet and are informative study subjects for investigating dietary shifts in response to environmental variation. We investigate the phenological characteristics of plant foods and calculate monthly fruit production and probability of fruiting for each dietary species and report on how capuchin foraging varies intra- and interannually. We compare the dietary importance of foods consumed over two 1 year-long sampling periods. Finally, we determine how food use changes seasonally by comparing biweekly diet variation. Most plant food species examined produce fruit seasonally, although two important species are aseasonal. The overall biomass of capuchin fruit foods varies considerably monthly and annually. During scan sampling, capuchins were observed to consume 90 different plant food species across 24 months of study. Almost half of these plant foods were only consumed during one of the two study years, but such foods accounted for only 10% of the plant diet. Within 2-week periods, capuchins were typically reliant on one or two plant foods (i.e., >50% of the diet for that period), but few plant foods were important for multiple periods. This study illustrates the importance of studying both food and foraging characteristics at different scales and demonstrates the necessity of long-term projects for interpreting foraging behaviour. 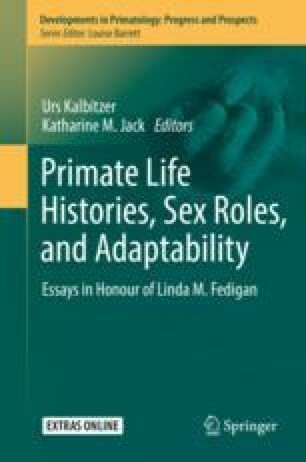 We would be remiss to start these acknowledgements any other way than by acknowledging the past and present guidance, support, and friendship of Dr. Linda M. Fedigan; it is an honour to be a part of a festschrift for such a wonderful primatologist and person. We thank the government of Costa Rica, particularly the park administration staff of Santa Rosa, for the opportunity to conduct this research and for their continued support of our project. The data behind this chapter was collected by many dedicated field personnel over many years; thanks to you all. We thank Urs Kalbitzer as well as one anonymous reviewer for their thoughtful suggestions that greatly improved this manuscript, and thanks also to Urs for his patient assistance in compiling R code for creating GLMMs and their graphical output. Funding was provided by the University of Calgary, the Natural Sciences and Engineering Research Committee, and the Canadian Research Chairs Program.